Hello everyone and happy new year. 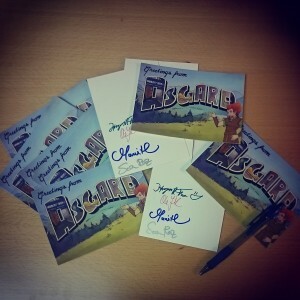 Postcards for our Kickstarter backers are going out this week! We also have a new team member to announce this week – Sara Raz, who is joining KreativeSpill as a marketing and social media manager. Sara will be taking up the reigns on our social media platforms, so expect to hear lots more from her soon! We hope everyone out there is having a great start to their new year! Twitter Contest: Join Loki in Exile! Enter our Twitter contest for your chance to appear in-game! Join Loki in Exile with our new art for tweets contest! Starting today, right now, for the next three weeks and until the end of the Kickstarter we will be picking one winner each week to appear in our game – Just like in our $120 Reward Tier on Kickstarter your likeness could be used as an in-game painting, a statue, or even NPC, but here all for the cost of following us on Twitter and helping spread the word about our contest! What’s even better: At the end of the Kickstarter, successful or not, one lucky person from these three weeks will receive a hand-painted portrait of one of the backgrounds from Norse Noir: Loki’s Exile, FREE! Postage on us! This will be a beautifully done piece by lead artist Ole Jacob Kiellend, responsible for all of the wonderful scenery in our game. Normally this is ONLY available in our $800 Reward Tier on Kickstarter, so this will be a darn good bargain for one lucky winner! Our first winner will be chosen on September 3rd at 05:00pm EST – Winners will be notified by direct message on Twitter. You MUST respond to our DM within 48 hours or else another winner will be chosen! All winners will be announced on our Twitter page as soon as they have replied – Likewise, all winners must be willing to sign standard waivers allowing us use of their likeness in our game (keeping the lawyers happy is a must, unfortunately). Also, all entrants MUST follow the Twitter Contest Rules & General Rules of Conduct – Breaking these is bad and won’t win you any prizes. Again, just follow @NorseNoir and retweet our contest announcement for your chance to win – Good luck, and we’ll see you on Twitter! Loki’s Exile: The Kickstarter – Day 2! Wow! We want to take a moment to thank everyone for the awesome showing of support so far – At the time of this posting over 40 people have generously backed our project, and we think that’s a great start! Our Facebook page and post about the Kickstarter has gotten a lot of views and shares, and we’re even starting to get some media coverage! Alexander Bradley of Anything Geeky Reviewed has been gracious enough to put up some very kind words about our game that will hopefully help spread the word. We have lots more planned and in store for the next thirty days, so follow our blog, Facebook and Twitter for more news and updates incoming soon. In the mean time, thank you again to everyone who has backed and supported us so far, and please remember – We need your help to make Loki’s Exile a reality. Every dollar pledged, from one to one hundred, makes a difference. Stay tuned for more!